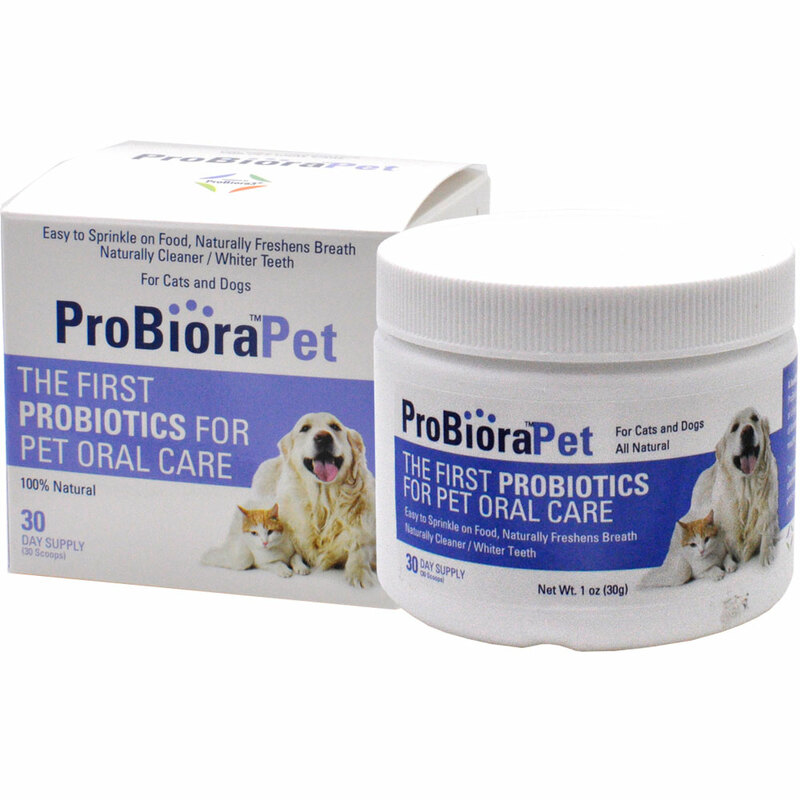 ProBioraPet Probiotic Oral Care is a natural probiotic oral care supplement for cats and dogs. 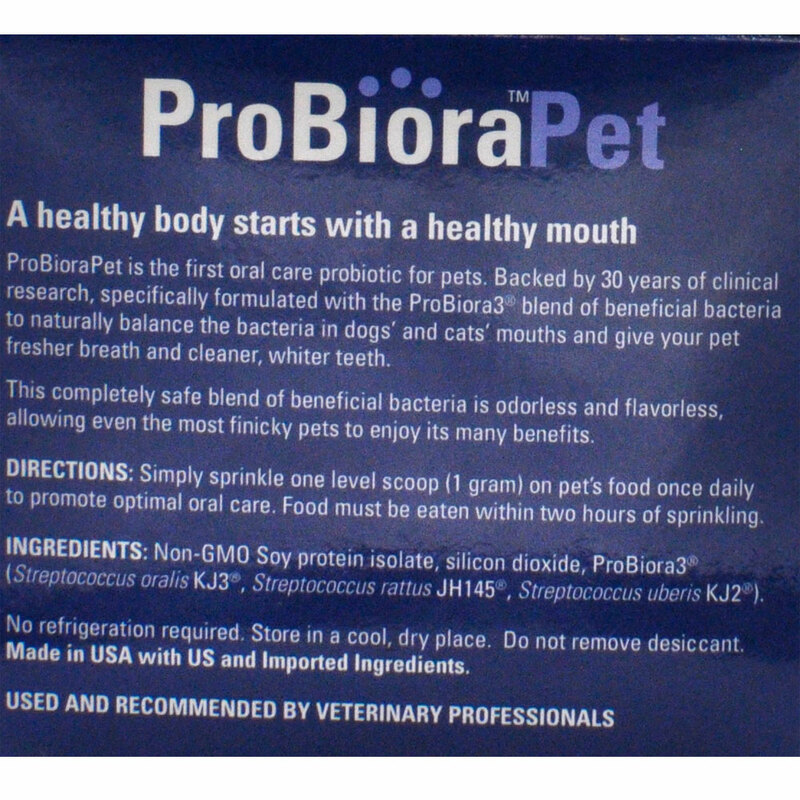 ProBioraPet contains ProBiora3, a blend of beneficial bacteria, which naturally balances the bacteria in your pet's mouth. This promotes fresher breath and cleaner, whiter teeth. Simply sprinkle ProBioraPet onto your pet's food daily. It is completely odorless and tasteless, able to bypass even the most finicky of eaters. 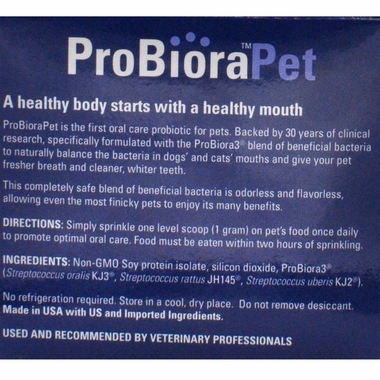 Pet oral care no longer has to be a chore with ProBioraPet! Contains ProBiora3, which naturally balances the bacteria in your pet's mouth. Promotes fresher breath, and whiter, cleaner teeth. Soy protein isolate, silicon dioxide, ProBiora3 (Streptococcus oralis KJ3, Streptococcus rattus JH145, Streptococcus uberis KJ2). Simply sprinkle one level scoop on pet's food once daily to promote optimal oral care. No refrigeration required. Store in a cool, dry place. Made in the USA. My picky cats don't notice Evora Pet on their wet food. I give it to them for dental health. I have ordered from Healthy Pets for years, and I really love this on-line retailer. ConsThe team here at Healthy Pets is thrilled to hear such good feedback, and we're proud to be trusted with all of your pet needs so consistently. We thank you for your business! It really works. It takes a few days to \"kick in\" but it really works at neutralizing my dog\'s breath.